High-strength steel, hydraulic cab mounts, 5-link suspension, Frequency Response Damping shocks. Yup! This week’s Truck Thursday is going underneath that beautiful ‘skin’ of the 2019 Ram 1500 for a look at how a durability ‘shake-up’ plays a big role in this all-new truck’s ‘no compromise’ durability promise. The Road Test Simulator is a key part of durability testing at CTC. While it might sound tame and routine, once the simulator was up and running, the all-new Ram 1500 was subjected to months of extreme ‘shake, rattle, and roll’ punishment, much more intense than an average driver would experience, to make sure this truck will deliver uncompromising strength and durability over a lifetime of ownership. 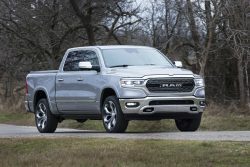 FCA US test development engineer Jeff Walz takes us into the Road Test Simulator lab for a closer look at the 2019 Ram 1500 being subjected to a series of punishing tests programmed from real-life road tests at the company’s Chelsea Proving Grounds.